I think that humans are probably the only animals who feel a need to have rooms in their domicile. A bear can sleep in a wide-open cave, a fox can sleep in a tiny hole, and a fish, when in captivity, sleep in a bowl. If we lived like our pet fish, then we would all live in studio apartments that would, at best, have more useless space. Now this aquarium is something that would give any fish bragging rights. 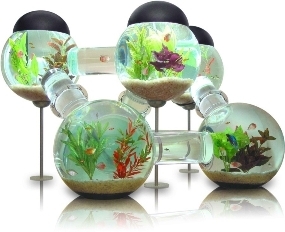 I mean, I can just see a celebrity fish boasting about this “bowl” on a fish version of Cribs. I mean, look at the thing! It’s like hamster trails designed for fish! This is definitely one place a fish would not mind sharing with other fish. If Gil, the Willem Dafoe fish from Finding Nemo, was in this castle of a fish tank, he never would have tried to escape. This is what Oscar should be living in when he got rich in Shark Tale. Yeah, not many people make references to the latter movie. Do you those rich people who spend a lot of money on their pets? Consider this $6500 investment a diamond-studded collar for your fish. Yes, that’s is how much this fish tank (if you can even call it that) actually costs. Why shouldn’t fish get some of the rich-doting action that is usually reserved for dogs and cats? This makes me want to go buy some fish. Love it!